Elizabeth I. Aldrich writes to ask if the Schools have received a box of used clothing her sewing circle sent. She asks for an immediate answer so they can send tracers if needed. 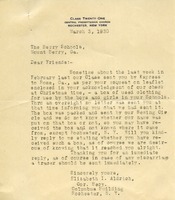 Helen express concerns that Miss Fannie Hatch never received a letter from Miss Berry detailing what her circle needs to make for the schools. She requests that Miss Berry sends instructions and measurements at her earliest convenience.